Actual footage of me staring at my bookshelves. 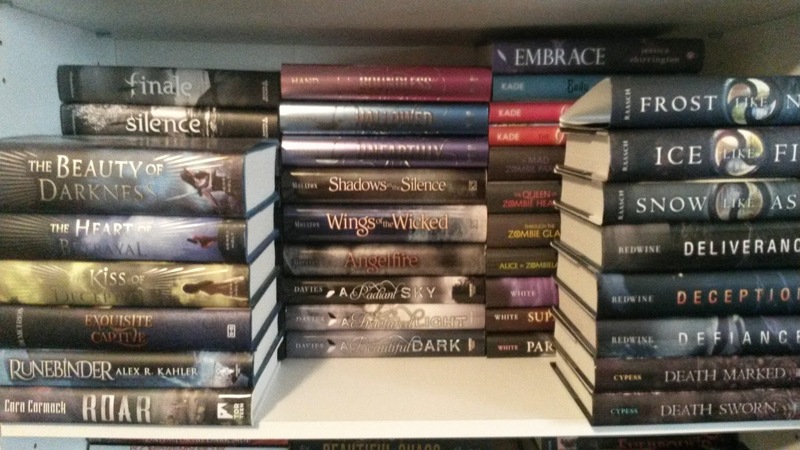 On days that I don’t have other posts planned, I’ll share photos of a bookcase. I currently have five-and-a-half-ish bookcases that I’m planning on sharing. This will be bookcase one. 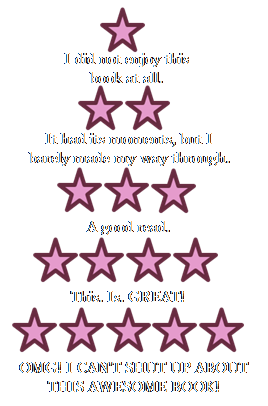 It holds a mix of fantasy and paranormal YA books that I’ve read. The very top shelf on this bookcase contains my Harry Potter collection. I’ve got 1–6 of the Harry Potter books in beat-up paperbacks and all seven in hardcover, plus The Cursed Child, two illustrated versions, and a movie creature companion. 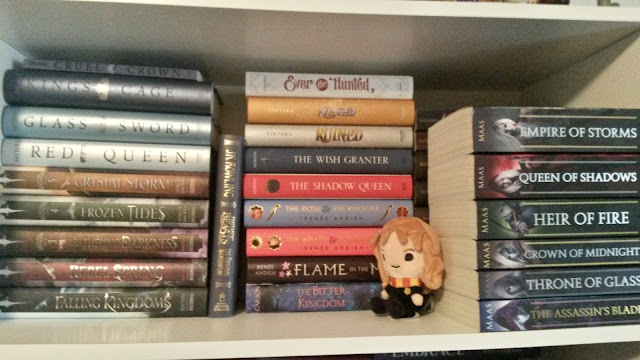 I also have multiple copies of the shorter books, like Quidditch Through the Ages. 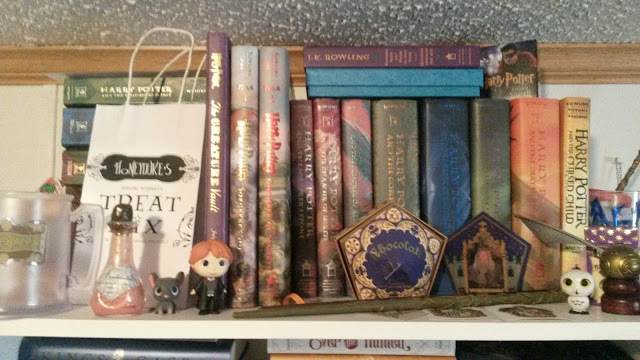 I received the screenplay version of Fantastic Beasts and Where to Find Them for Christmas, but I didn’t really have the time to add it this shelf since I would have had to rearrange everything. 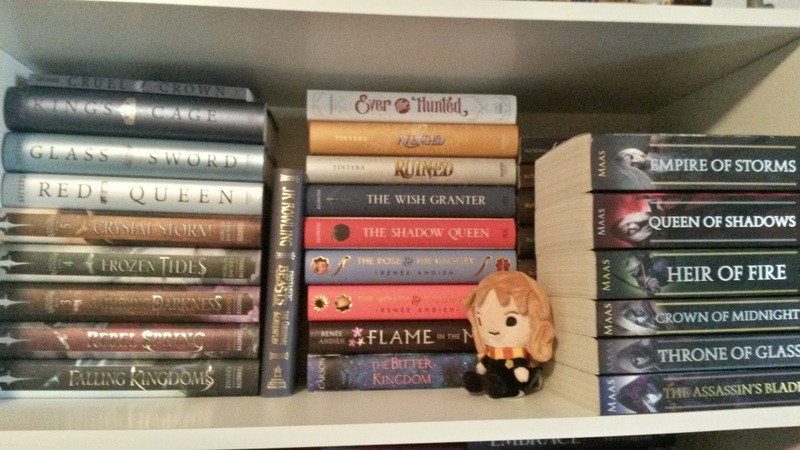 The shelf below the Harry Potter one contains my YA fantasies and a Hermione plushie. 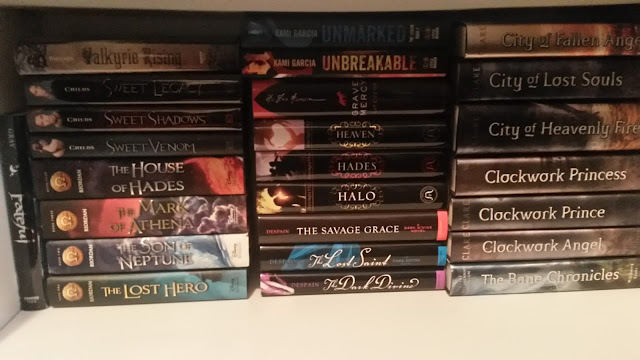 I have to layer my books and stack them in order to fit them on my bookcases, so behind the Throne of Glass stack are some more YA fantasy books. 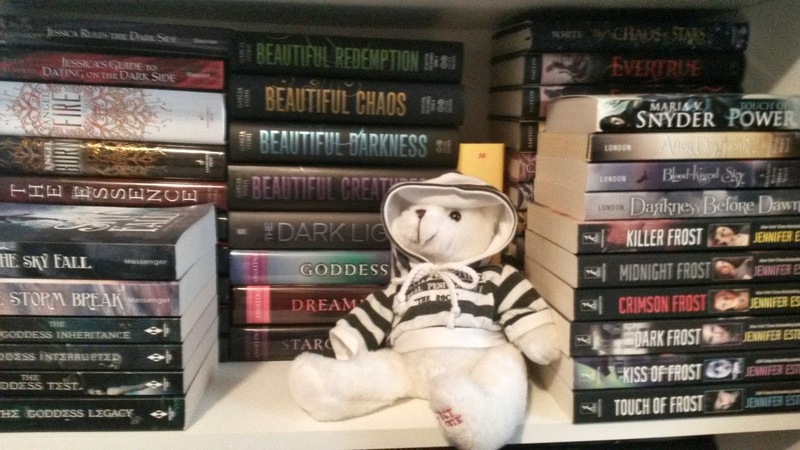 The second shelf down is a mix of YA fantasy and YA paranormal books. I have some Mary E. Pearson, Becca Fitzpatrick, Cynthia Hand, and C.J. Redwine here. Behind the Pearson and Redwine books are Lauren Kate’s and Kiersten White’s books. The next shelf is primarily YA paranormal. There’s some Jennifer Estep, Aimee Carter, and Josephine Angelini. 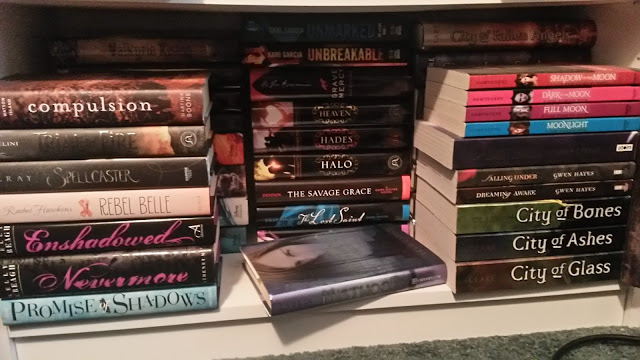 Behind those are Kimberly Derting and Meg Cabot books. This shelf is kind of dark because it’s closer to the ground (and thus, farther from the light), but it’s also mostly YA paranormal. 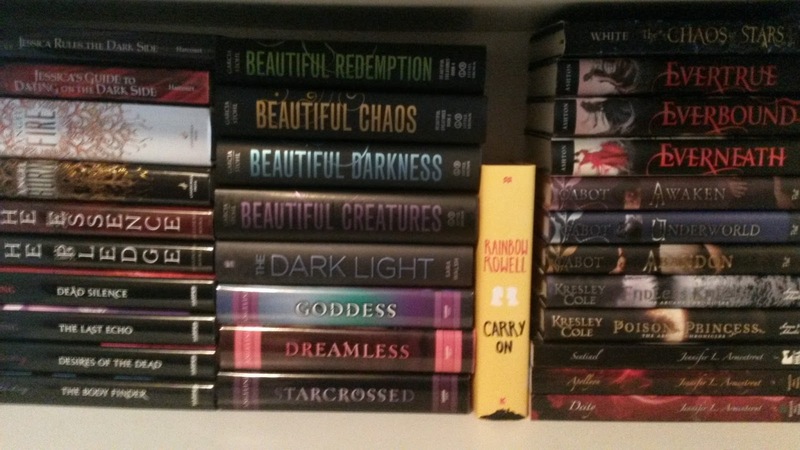 Here there are Rachel Hawkins, Julie Kagawa, and Kresley Cole books. 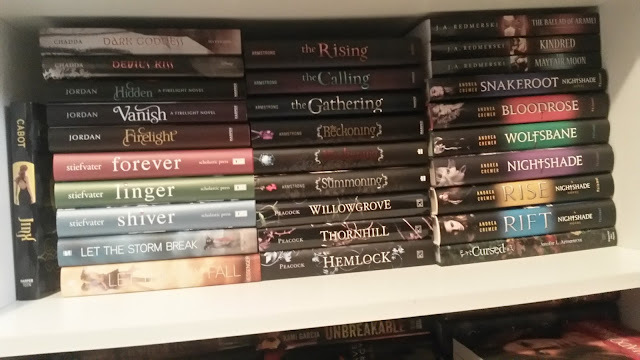 Behind those are Andrea Cremer and Maggie Stiefvater books. 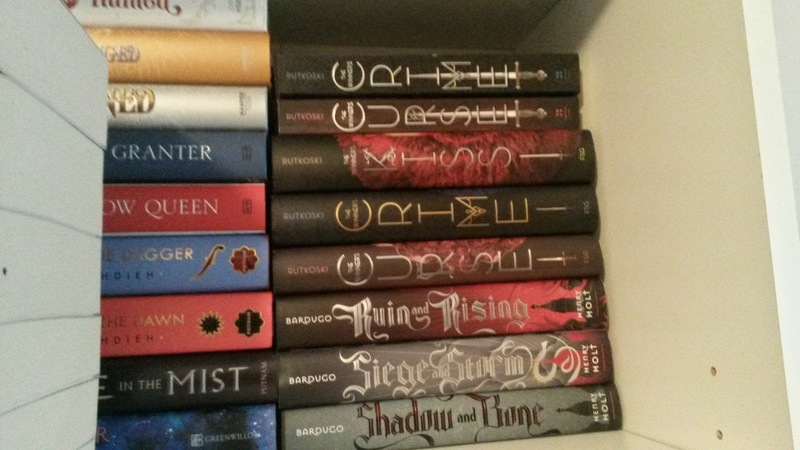 Behind those books, there are some Cassandra Clare and Rick Riordan copies. Whew, well that’s bookcase one. 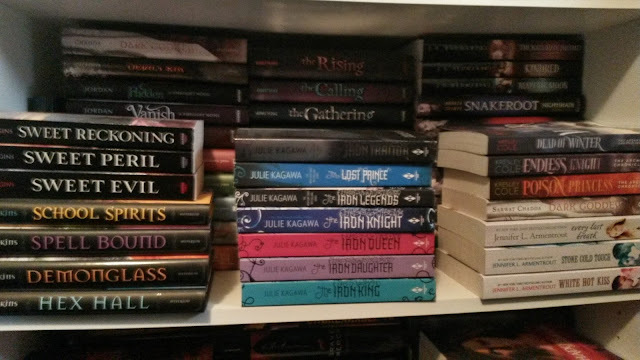 Are there any titles pictured that you have on your shelves? Everneath is a good one! Lots of pretties! 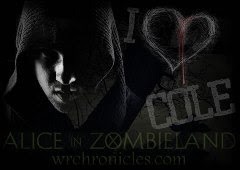 I have a lot of these books in my kindle account. I don't think I have any of these in paper though. I see just the jacket for one book. 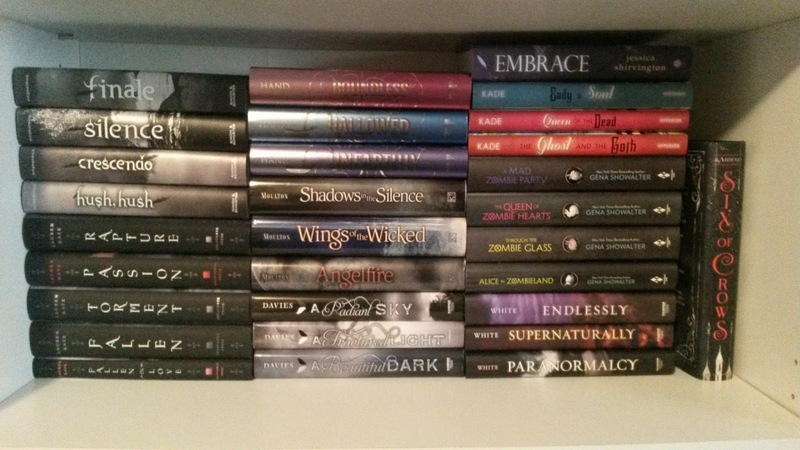 We always have book jackets on our shelves because we take them off to actually read the book. Thanks for letting us have a peek! Yep. I have to take the dustjacket off to read hardcovers. I just don't want them to get damaged.